"Here's how I look at it. Everybody's tried to make a great product for the living room. Microsoft's tried, we've tried -- everybody's tried. And everybody's failed. We failed, so far. "So there's a whole bunch of people that have tried, and every single one of them's failed, including us. And that's why I call it a hobby. It's not a business yet, it's a hobby. 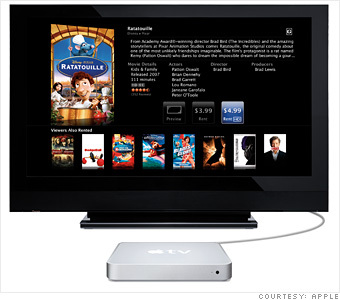 "We've come out with our second try -- 'Apple TV, Take 2' is what we call it internally. We realized that the first product we did was about helping you view the content of whatever you had in iTunes on your Mac or PC, and wirelessly sending it to your widescreen TV. "Well, it turns out that's not what people really wanted to do. I mean, yeah, it's nice to see your photos up on the big screen. That's frosting on the cake, but it's not the cake. What everybody really wanted, it turned out, was movies. "So we began the process of talking to Hollywood studios and were able to get all the major studios to license their movies for rental. And we only have about 600 movies so far ingested on iTunes, but we'll have thousands later this year. We lowered the price to $229. And we'll see how it does. Will this resonate and be something that you just can't live without and love? We'll see. I think it's got a shot."